Human Rights Advocate Tracy Robinson Urges closer involvement in promoting social justice for all in the Americas… — UTech, Ja. Ms. Tracy Robinson, Former President of the Inter-American Commission on Human Rights (IACHR) and Senior Lecturer, Faculty of Law, The University of the West Indies, Mona delivering the UTech, Jamaica/OAS Distinguished Public lecture on the topic "The Inter-American System on Human Rights for all the Americas, Including the Caribbean” at the UTech, Jamaica Papine campus on Wednesday, April 24, 2018. 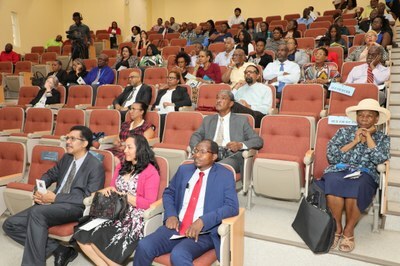 The University of Technology, Jamaica which is this year celebrating its 60th anniversary and the Organisation of American States (OAS) which is marking its 70th, on Wednesday, April 18, 2018 hosted a Distinguished Public Lecture under the title "The Inter-American System on Human Rights for all the Americas, Including the Caribbean." The lecture was delivered by Tracy Robinson, former President of the Inter-American Commission on Human Rights (IACHR) and senior lecturer in the Faculty of Law, University of the West Indies, Mona. Robinson is also a current Commissioner on the Independent Review of Equity and Health Inequalities in the Americas, initiated by PAHO/WHO in 2016. Prefacing her discussion with the concession that the Inter-American Human Rights System is an “imperfect system,” Ms. Robinson argued however, that the Americas still remains a meaningful way to think of ourselves, given not only our geographical proximity, but the shared history of perverse inequalities of multiple groups of people across the Americas, much of which she pointed out is still pervasive today. Inequalities abound, she noted in areas such as opportunities for education, violence against women, LGBT persons and other marginalised groups, land rights issues of indigenous peoples, migration and nationality issues across the Americas, and other forms of inequalities. In one such case,The Inter American Commission visited Jamaica in 2008 to bring sharp focus to the violence against the gay community and in Haiti following the 2010 earthquake, the IACHR issued precautionary measures to the US after the deportation of Haitians. The role and function of the IACHR, Ms Robinson explained, is a quasi-judicial autonomous body of the Organization of American States (OAS) with the mission to promote and protect human rights in the American hemisphere using a variety of mechanisms. The Inter-American Commission established in 1959 has its headquarters in Washington, D.C. It is composed of seven independent members who serve in a personal capacity and comprises 35 member states. Three Jamaicans have served as President of the IACHR including current President, Ms Margarette May Macaulay since 2016 who also served as President of the Inter-American Court (2006-2012), Ms Tracy Robinson (2012 to 2015) and The Hon. Patrick Robinson, OJ (1988 -1995). The IACHR works together with the Inter-American Court of Human Rights installed in 1979 as part of the organ of the Inter-American System for the protection of human rights. The Court headquartered in Costa Rica acts as an adjudicatory and advisory body and issues binding rulings for countries that have ratification of the American Convention – the central pillar of the Inter-American Human Rights System. Only 20 of the 35 member states in the Americas fall into that category. The IACHR carries out its mandate through a variety of modalities including public hearings, a petitions system request for information from States, country rapporteurs, press releases, reports and other general monitoring, promotion and public policy mechanisms. Looking at Caribbean country’s participation in the Inter-American Rights system, Ms. Robinson lamented that there has been limited engagement in the ratification of the American Convention. Quoting US Civil rights advocate, Bryan Stevenson, Ms. Robinson concluded that “we must get more proximate to the issues we are trying to address and the people we are trying to empower, emphasising that human rights protection for all in the Americas should be thought of as a dialogue and not just an outcome. A spirited Question and Answer session followed the main presentation. A large audience comprising members of the legal fraternity, educators, students and members of the public was present. 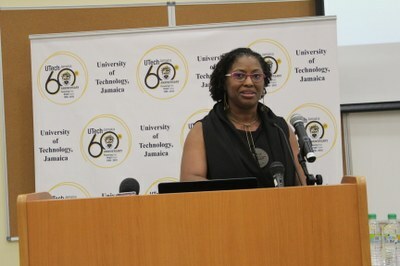 The proceedings were chaired by Mrs. Marcia Robinson Acting Dean of the Faculty of Law, UTech, Jamaica. 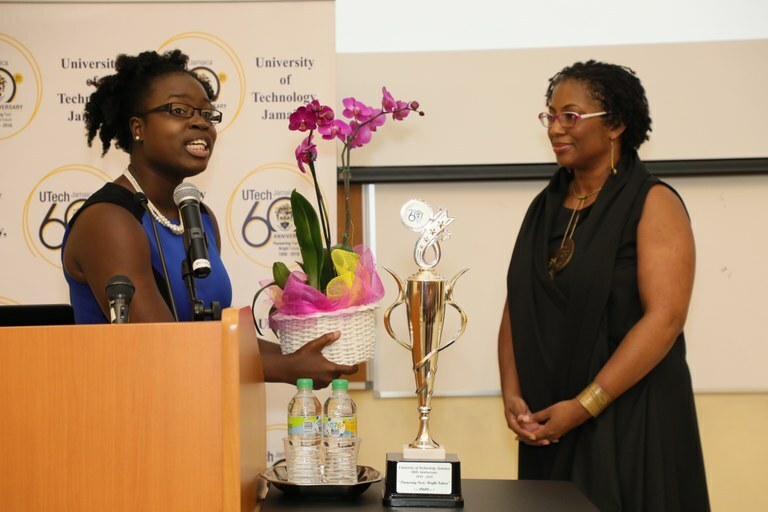 In appreciation: Mrs. Alicia Dixon Stone, (left), Lecturer, Faculty of Law, UTech, Jamaica presents an orchid to Ms. Tracy Robinson, Former President, Inter-American Commission on Human Rights and Senior Lecturer, Faculty of Law, UWI, Mona following her presentation.